Today I'm blogging on the Sizzix blog with a video tutorial for two techniques - how to spring load a card so it opens automatically, and how to split and double the card fold allowing for two pop-ups inside. The card in the video is Gretchen's birthday card. Visit the Sizzix blog to see more photos and a full supply list. I don't think it's any secret that I am a fan of patterned paper and my cards usually include it. But today felt more like a "make my own background" sort of day. I wanted to use my Dina Wakley "Lonely Girl" stamp and she was crying out for some sort of artsy layered creation. 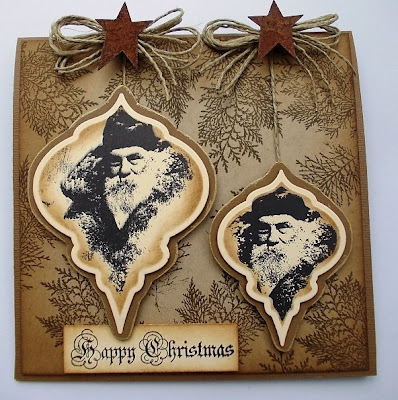 The outer card is made from matboard, which took the mists and stamping just beautifully. 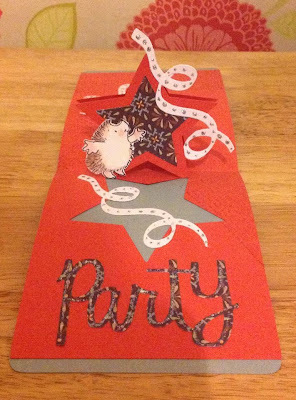 The inside of the card is made with the Pop 'n Cuts Base A2 Card kit, cut from both cardstock and canvas. The canvas is misted and stamped and then mounted to the cardstock for stability. I love going stash diving when making these artsy creations. I found some filagree wings and a bejeweled crown charm. The primitive heart is die cut from plastic paper, embossed, shifted, debossed, inked, silver-penned edged and then wrapped with silver cording. The greeting is on my new Fancy Frame die. The larger piece was cut from plastic paper, stamped with the greeting, and then layered over the smaller piece, cut from cardstock. I used tiny eyelets to connect the two pieces. The medallion at the top of the card is one of my older Sizzlits, similarly inked. I used a combination of Luminarte and Tattered Angels mists - whatever I had that was in the orange/yellow/fuschia family. This card was a lot of fun! 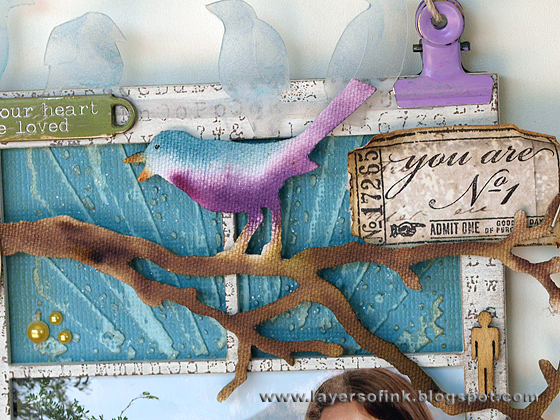 Here are links to the dies and to the Dina Wakley art stamp. Today's Pop-up 2Torial will show how to assemble the Bigz Raising Platform die #658042. This die, although ultimately quick and easy to assemble, has a couple of origami folds that can be tricky to figure out for the first time. I've been getting a few e-mails from folks asking for a video tutorial. What I thought might be helpful is to re-make the card that is on the front of the packaging so that anyone who purchases the die has the package sample for reference when making their own version of this card. Also, I happen to love the card on this package, which was created by Cara Mariano, Art Director for Sizzix. The video is not under 3 minutes and I'm starting to really regret my naming choice of "2Torial"! Ha! It's 6 minutes, but pretty concise. You'll have the Raising Platform mastered by the 3:42 mark, and then the rest is showing how to do the fluffy flower folds and the front decoration. Look for the Sizzix dies at your local scrapbooking and paper crafting stores. Or, if you prefer to shop online, Scrapbook.com has almost every supply I used, so I uploaded the card there and linked in all the supplies. Click on the thumbnail below to view this project and all the supply links at Scrapbook.com. Need some additional inspiration for the Bigz Raising Platform die? Here are some other card and layout ideas. Click on the photos to go to their blogs and see additional photos and supply lists. Anna-Karin created this stunning white-on-white card using the Raising Platform and it was chosen as a Fab 5 winner by Hero Arts! This 6x6 Christmas card shows how you might use the Raising Platform to animate something larger, like a gift card or a photo. Simply attach the item to the platform, making sure that your card is big enough to cover the item when the card is closed. In the same manner, you can replace the label that comes on the die with any other object, folded up the middle, and allow the platform to animate it. Think butterflies, and hearts, and gothic skulls! As always, I love to see what you create with my dies! Send me links to your blog posts or tag me on your Facebook uploads so I don't miss them! On December 1st I'll be teaching an interactive Christmas Circle Album at Scrapp'n Savvy in Spring, TX. The first two sessions sold out so we've added a third. Call the store if interested. I enjoyed creating this class with one of the Interactive Chipboard Albums that I designed for Echo Park. The paper line is Very Merry Christmas by Jessica Sprague for Echo Park. 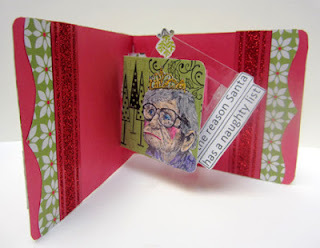 There are also several of my new Hearth & Home Sizzix dies worked into the class. Speaking of the new dies, here are the winners of the GIVEAWAY, chosen by random number from members of my mailing list who left a comment on my last post. If you are not already a member of my mailing list, fear not a full in-box because I am absolutely terrible at sending out e-mails. But when I do, I will often give the list a chance to win a prize, so just hunt up the blue button in the left sidebar and sign up! Peg and Nancy each get to pick two dies from the Hearth & Home collection - either Pop 'n Cuts inserts, matching accessory Sizzlits, or Bigz dies. I'll be contacting you both by e-mail for your addresses. Congratulations! Peg Smith - I'm So excited these products are in the stores now!! A must have for me is the ALBUM ACCORDIAN FLIP 3D. I haven't been this excited for a long time! You're work is exquisite! 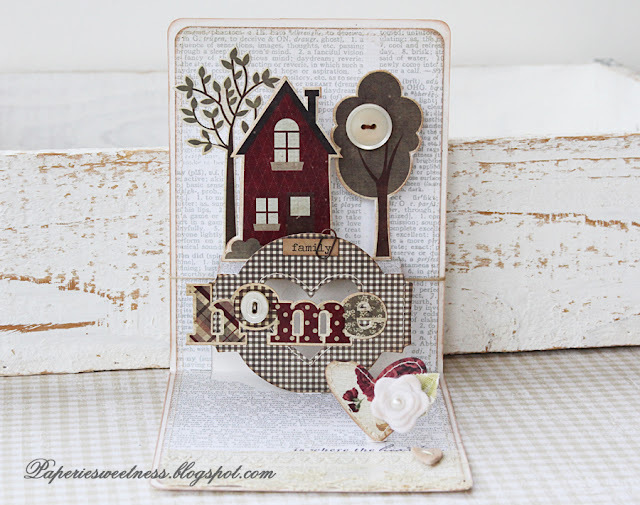 Nancy Walker - I just love all the new Pop 'n Cuts Hearth and Home series dies. I have a few now, but I would love to add the ribbon tree insert to my collection. I hope Santa is listening! Here are more photos of the class. Turn the page to the second interior spread and notice the Accordion Album on the right page, held down by an oval-shaped closure. I didn't photograph the back of the album, but it offers more real estate for photos and journaling. Plus, each page has a pull-out section, so you'll be able to cram a ton of memories into this album! There are some accessory items (optional purchase) that you can buy at the store to further embellish your album with matching stickers, etc. and you'll also have some leftover paper. Adhesives - whatever you most like for wallpapering paper to chipboard. Some wet glues that I like for this are Tombow's blue mono and Zip Dry (but you have to work fast). I also have used a tape runner, but you'll use a lot, so bring a refill. Some of my instructor friends swear by Yes Paste. Other adhesives - small pop-dots will be great to elevate the layered wreath. You'll also want a strong tape, like tacky tape or Scor-tape, for attaching the Accordion Album. I always like having mini glue dots in class - very helpful for flourishes, etc. Crop-a-Dile or 1/4" chipboard hole punch. Clean brayer - optional, but this can be great if you're using wet glue to wallpaper the pages. What I like to do with my die collections is to create optional decorator dies to fit the pop-ups. 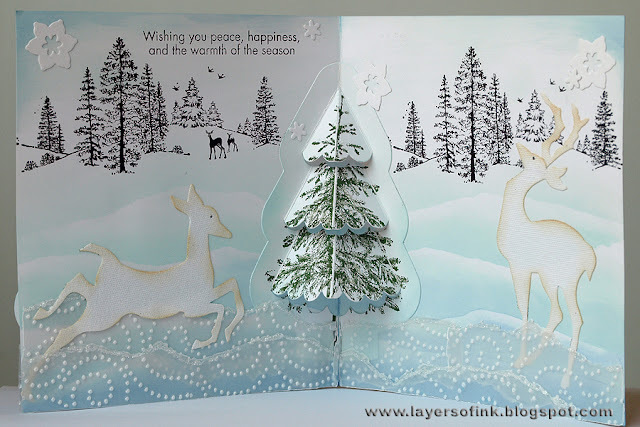 These decorator dies can also work on their own as flat dies, independent of the pop-ups, as you'll see in this first card, which uses the Ribbon Tree from the Noel Sizzlits Set on the front of the card as a stand-alone item. 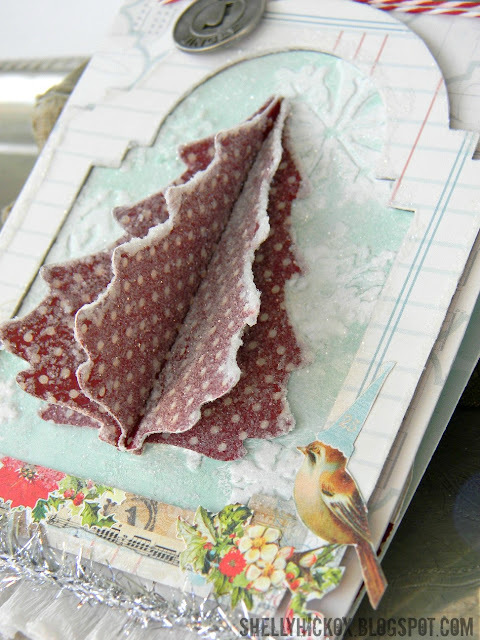 I've also used the Poinsettia from the Noel Sizzlits Set to decorate the interior of the card above the pop-up. The third Sizzlits in this set is the word Noel, which can be used flat, but also fits the Noel Pop 'n Cuts insert just perfectly, leaving a small shadow. Often the Sizzlits sets for the Pop 'n Cuts collection will decorate more than one insert. In the case of the Noel Sizzlits set, it actually decorates THREE inserts! Next up, the Pop 'n Cuts Ribbon Tree Insert, which is one of four new "stand-up" designs. These Pop 'n Cuts inserts work a little differently than all the previous ones. Notice in the "Noel" card above that the card is meant to be viewed at 90 degrees. The top half of the card interior becomes a backdrop of the card. In the case of the "stand-up" designs (Ribbon Tree, Poinsettia, Frame, Star), the finished card will open up fully flat, to 180 degrees, and the pop-up will stand-up in the middle of the card. Assembly is just as easy, perhaps even easier, because all that is required is folding the mirror-image items upwards from their bases and gluing them back-to-back near the top of the image. Done! Pop 'n Cuts inserts always create the pop-up from the card itself, meaning they leave holes that need covering with a backing card. In the case of the "stand-up" designs, the holes themselves are interesting and can be backed, covered or filled for interesting results. In the case of the Ribbon Tree card that's next, the coordinating Ribbon Tree Sizzlits was used to not only decorate the pop-up, but also to fill the holes with trees. On the above card I also made use of some decorator pieces from other dies. The vine is from the Hello Sizzlits Set and the label (stamped with Merry Christmas) is from the new Raising Platform die. The other Pop 'n Cuts insert that is decorated by the Noel Sizzlits Set is the Poinsettia insert. There are a couple of ways you can use the Sizzlits to decorate the pop-up. You can use the solid Poinsettia or the single petal/leaf piece. For this next card, I cut seven leaves and created a larger decorator poinsettia to fit the pop-up. Then I used the solid poinsettia from the Sizzlits set to decorate the holes. My new Ornate Plate die makes a great wreath for the front of the card. For this card I embossed texture and added a bow. Simple! 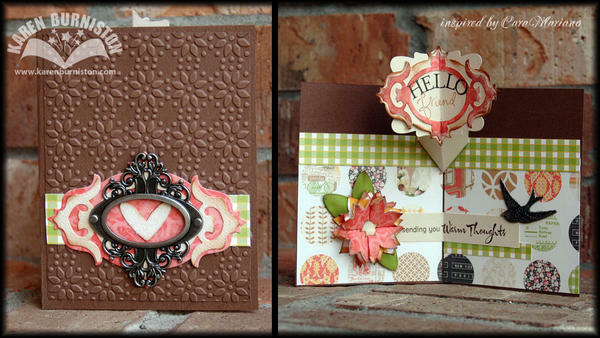 This card also makes use of decorator pieces from other dies. I used the Frame Label die for the Merry Christmas piece and the wreath from the Door die on the lantern. The holiday season is here. Let's do this! In the spirit of Giving Thanks, I thought I would post this card made with some of my newest Hearth & Home dies, available now in stores. The pop-up in this card is the new Bigz Raising Platform, so it is not part of the Pop 'n Cuts collection. I need to do a proper tutorial video on it, but in the meantime, Karl recorded me assembling it in two quick iPhone videos. The PDF instructions can be downloaded, but trust me - the videos make it much easier! Start by finding every fold. If the score lines are faint, try shimming under the die with a piece of cardstock or cutting two at a time. You really want to be able to see the score lines so you fold them accurately. Work every fold one way and then the other so they all fold easily. You can swap out the label that comes on the die with any other shape that you'd like to animate. Simply fold the item in half and glue it to the platform. For my card, I used a sticker from the collection by first sticking it to thin paper and cutting around it so it wouldn't be sticky behind the label. I styled the Silverware by cutting them from gray cardstock, embossing the handles (sorry, don't remember which folder I used) and then lightly brushing the silverware with gray ink. I found some clear stamps in my stash (old!) that I could bend into a shape that would just fit the outer contours of the Ornate Plate and used those to stamp the decor. I am thankful for many blessings in my life, and especially for my friends! You can also upload your own Pop 'n Cuts card and there are prizes to be had, so definitely head on over there to check out the fun! This is an A7 card with a clear front to see the spinner in the "closed" position. As the card is opened, the spinner starts moving. When the card is fully open the "Happy Holidays" greeting is revealed. Make sure you hop around and see all the projects from the talented Sizzix Design Team! I am thrilled and honored to have these talented designers working with Pop 'n Cuts! Skellie was born on October 23rd, 2012 in the midst of a massive studio purge/clean session. The skeleton stamp set had recently arrived from Lost Coast Designs and, having ordered him over the internet, I had no idea that he was going to height-in at over 10" tall! The massive purge/clean session was months overdue and I was attempting to return my studio to its former glory while simultaneously impressing and confusing my friend Eileen Hull, who was due to arrive on October 25th and had always heard me say that my studio's regular decor was "Hoarders Chic". Meanwhile, my friend Gretchen, who lives close enough to make any sort of neatness facade on my part completely futile, was regularly checking up on me via text and encouraging me to stay on track with the cleaning. I suggested that whoever told her I was not cleaning and instead assembling a giant stamped skeleton was obviously delusional as I would never do such a thing. Why don't you come over and see me sometime? Gretchen thinks I'm cleaning! Tee hee hee! With a synergy that could only be arranged by mysterious mystical Skellie forces, I also received a "what up?" text from Shelly Hickox, thus ensuring that she, too, would start receiving Skellie poses. It's just that the cleaning is so TIRING! Shelly proceeded to tell me to knock it off, already, because she was a VERY.IMPORTANT.CRAFTER and was trying to WORK.ALREADY! She said she was filming a tutorial video and lamented that her voice sounded like (her words, not mine) Minnie Mouse. All done except over there! If you can believe it, I did finally grow weary of posing Skellie, taking pictures of him and harrassing my friends. (I know! Cray-cray!) I finally let him thank the audience and bid adieu. The goal with Skellie was to have him dancing on the front of a card. To do so, he was going to require some string and a pull cord. I found a charm of two bones and some black beads and got busy stringing up his dance cord. I'm not exactly sure why I didn't notice what everyone else noticed . . . I showed it to John and he instinctively did what all men do when faced with such a jarring image. He clutched the front of his pants and winced. JOHN: OUCH! That looks terrible! Why exactly did you choose to use TWO beads? ME: What? I'm not sure what you . . . oh. Right. Shelly also had a few comments about poor Skellie's medical condition. I pointed out to the critics that he was still smiling, herniated jiggly bits and all, but nonetheless he went into a corner until such time as I could find time for reconstructive surgery. It was only a short while later that the FedEx truck arrived to deposit FIFTEEN BOXES OF DIES in my foyer. Having just sorted, purged and broken down about 25 boxes that day, I reacted to the arrival of my new dies in a less than mature manner . . . I walked right over to Skellie with a pair of scissors. SNIP! And yet he was STILL SMILING!!! I did finally get him onto the front of a card, though, with my double-spinner, etc. Finished it up as the first Trick-or-Treaters were ringing the doorbell! Notice that his junk string was cleverly hidden behind some pieces of paper? Voila! I also made him a cool pair of shades so he would coordinate with the card interior, featuring Chester & the Boneyard Band. You can see the mechanism for the double spinner in this side view. And that's the story of Skellie!